Compressor Start Assist Cera-Mite for Amana; Goodman; Janitrol equipment. 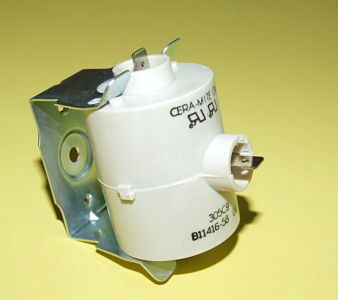 Replaces Part Numbers: B1141658; B11416-58; 305C9; 305C9L01. Used in Amana; Goodman; Janitrol Models: CK36-1T; CK361T; CKH60; CKJ36-1; CKJ361; CKJ36-1A; CKJ361A; CKJ42-1; CKJ421; CKJ42-1A; CKJ421A; CKJ48-1; CKJ481; CKJ48-1A; CKJ481A; CKT36-18; CKT3618; CPJ48-1T; CPJ481T; CPKE60; PCJ036; PGJ036075-1A; PGJ0360751A; PGJ036100-1A; PGJ0361001A; PGJ042075-1A; PGJ0420751A; PGJ042100-1A; PGJ0421001A; PH060; PHKJ024-1A; PHKJ0241A; PHKJ030-1; PHKJ0301; PHKJ036-1A; PHKJ0361A; PHKJ048-1A; PHKJ0481A.